As the old adage goes: Instagram or it didn’t happen. Dubai holds some truly sensational locations that deserve to be visited – and documented on social media, of course – with one of the most popular Atlantis, The Palm. An architectural marvel and visual treat, this luxury 5-star hotel has been a staple across social media channels since it opened its doors to the world in 2008. The iconic luxury beachfront resort has an amazing array of signature underwater suites, unique marine and waterpark attractions, inimitable family-friendly entertainment offerings and thousands of marine animals in its expansive waterscape surrounded by The Palm Islands. The most luxurious and exquisite of our signature suites, the Royal Bridge Suite is absolutely where you are going to want to be when you take your most liked Instagram shot yet. Complete with three spacious bedrooms, all overlooking a beautiful panorama of sparkling blue waters and endless skies, the Royal Bridge Suite is located within the main bridge at Atlantis The Palm’s Royal Tower. With its own guarded entrance and elevator, as well as an opulent interior that perfectly blends Arabic elegance with contemporary luxury, you are absolutely going to want to preserve that memory on social media. It is where celebrities and A-listers love to go when they are in Dubai; you are sure to bump into one of your favourite celebs or even an international social figure. And with so much to discover in the suite, you will have enough Instagram posts, stories and material for days and weeks and years to come. Whether you go for the scuba diving experience or choose to avoid the waters and observe from the comforts of the palatial viewing room, this mega aquarium in Dubai is bound to become one of your favourite destinations to visit and document on any social media channel. The gigantic aquarium is the largest open-air aquarium in the Middle East and combined with the Lost Chambers Aquarium is home to more than 65,000 marine animals, including sharks, stingrays, exotic jellyfish, and is unlike anything you have ever seen before in your life. The viewing pane into the Ambassador Lagoon is 10 meters long and 70cm thick and if all the water was drained from The Ambassador Lagoon it would fill 4.5 Olympic sized swimming pools As one of the most sought-after marine and waterpark attractions in Dubai, the lagoon has been So put on your best Instagram face on and get ready for some one-on-one time with the deep blue waters and its fascinating marine dwellers. Sure, the prospect of posing in front of a flight of stairs doesn’t particularly sound like an enticing opportunity, but that’s only because you haven’t seen this one yet. Framing a swirl of beautiful, overlapping fountains and lined with a spectrum of tall trees, colourful flowers and vibrant greenery, the staircase gives new meaning to the stairway to heaven. Spilling directly from the main lobby and onto the resort’s main pool, the grand staircase provides numerous photo opportunities with a multitude of different backgrounds, all bathed in natural lighting. Because if you’re anything like us, then you know that the most beautiful Instagram moments sometimes come from the most unexpected of places. The perfect Instagram opportunity for the animal lover in you. Dolphins are without a doubt some of the smartest, most sociable and most beautiful marine animals to exist. Dolphin Bay at Atlantis The Palm offers visitors the rare chance to get up close and personal with these magnificent animals and a unique experience to be Different in Water. The If that doesn’t make for an exciting and awe-inducing Instagram story, then we don’t know what does. And don’t worry, even if you’re not quite ready to jump into the water and go swimming with dolphins, you can still take the time to enjoy the friendly mammals from afar, and maybe snag a quick Instagram Boomerang or two. You know those Instagram posts you often stumble upon when you are sitting at your desk working or stuck in a traffic jam in the back of a car? You know, the ones that make you want to pick yourself up and run straight to the nearest airport to find the perfect beach escape? Well, that escape is right here at Atlantis The Palm and it’s all yours for the taking. The Imperial Club will prove a defining experience for your stay at the hotel. Complete with an array of exclusive features that include personalized service, complimentary – and oh-so Instagram perfect – breakfast and private access to the sandy beaches of the resort, it won’t be long before you’re out there posting about your picture-perfect seaside holiday. As one of the world’s most breath-taking man-made islands, you might have seen plenty of pictures of The Palm. You might have even watched videos about it or read pages about its history. But absolutely nothing comes close to seeing it in person. 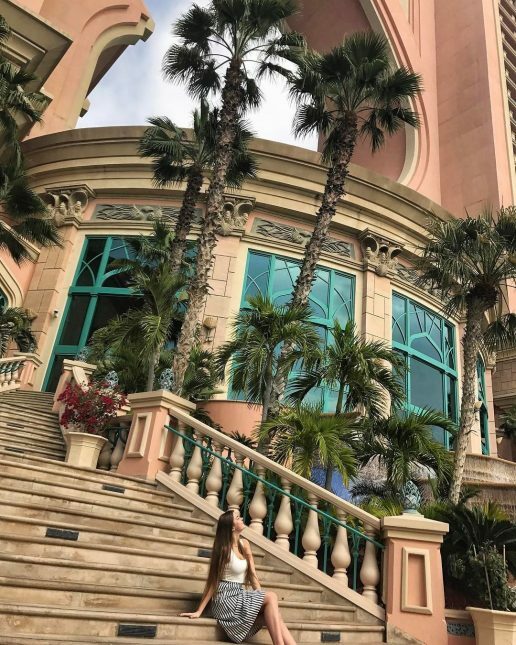 Atlantis’ Palm View Room is the ideal fodder for your Instagram page. Not only does the room overlook one of the most stunning panoramic views in the world, but it also features some pretty photo-worthy interiors and a slew of luxury perks that you will most definitely want to make the most of during your stay. Just snap the perfect shot, post it to your Instagram page and wait for your followers to start drooling. When you think Atlantis The Palm, the first thing that springs to mind might be white sandy beaches and softly lapping waves. Others might be luxury and comfort, sea life discovery and water adventures, or even beautiful views and great service. But little do you know, one of the hotel’s most beautiful landmarks lies in the middle of its main lobby. Standing at a towering 18 metres high, the Chihuly Sculpture remains one of the most impressive artistic pieces of the hotel and the city beyond. The first installation by Dale Chihuly in the Middle East, the structure comprises of more than 3,000 individually hand-blown glass pieces and took almost two years to complete. So admire the view, strike a pose and get ready to conquer the artistic side of Instagram. Disclaimer: The Daily Brunch does not hold the credits to the image or the content. Next articleIs Promiscuity A Good Idea?